Burnt Sienna is a warm, mid-brown color formed by burning the yellow-brown limonite clay called Raw Sienna. 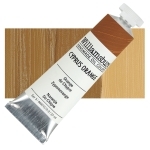 It ranges from semi-opaque to semi-transparent due to the combination of its opaque, red-brown mass tone and its transparent, orangey undertone. It is an excellent mixing complement for blues and greens and creates salmon or peach colored tints when mixed with white. It can be useful for subduing bright colors and does not get chalky in dark mixtures. Burnt Sienna has good permanence and is considered one of the most versatile of the permanent pigments. Burnt Sienna has no significant hazards. Burnt Sienna has been used as a pigment since prehistoric times, but its current name came about during the Renaissance. It comes from the city of Siena, in Italy, and is short for terra di Siena , meaning earth of Siena . Sienna was famous for the mining and production of earth pigments from the Renaissance until World War II. Due to the depletion of clay deposits in Tuscany, Italian siennas now come from other areas, including Sicily and Sardinia. Caput Mortuum, Italian Earth, Natural Brown Iron Oxide, Sienna, Spanish Red, Vandyke Brown. Transparent Pyrrole Orange is a yellow-shade orange with optimum performance; high saturation and excellent durability, excellent bleed resistance, and intrinsic strength coupled with good opacity and moderate rheology. It is semi-opaque, less opaque than Cadmium Orange. Transparent Pyrrole Orange has been demonstrated to have excellent stability and lightfastness in automotive applications. The Australian government's Department of Health and Aging, reported in its Summary Report: NA/238 that "Irgazin DPP Orange 16AOA is likely to be of low oral and dermal toxicity in humans and to be non irritating or very slightly irritating to the eyes and skin. It may cause lung irritation due to its particle size." Irgazin Orange was developed as a lead-free alternative opaque orange pigment. It is used in decorative, industrial, and automotive applications, often to color plastics and polymers.